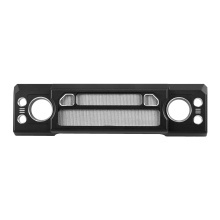 This aluminum alloy front face grille is designed for 1/10 Traxxas TRX-4 RC car rock crawler. With its terrific quality and performance, it can perfectly provide ample protection for your car body. It is the best choice for you, come on. Easy to install and durable in use. Suitable for 1/10 Traxxas TRX-4 RC car rock crawler. Reinforced aluminum alloy for strength and longevity of use. Secured onto the car with screws to provide extra strength and protection.